Wow! The circus is coming to town – to YOUR next party with our Crazy Circus themed party package! This package is perfect for kids who are a little bit older (over six), but have a passion for fun and performing! Your young guests will have a blast at your Crazy Circus themed party, and will get the opportunity to learn exciting circus tricks from real-life circus performers! 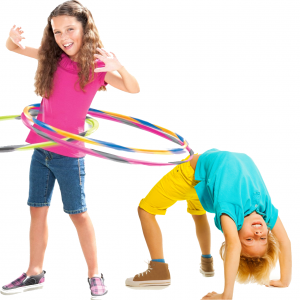 Fun activities like hula hooping, plate spinning, juggling and ribbons will keep all your guests entertained! This package is suited to older children, and includes fun games, prizes and singing and dancing activities! Generally our prices cover 90 minute parties. If you would prefer a longer event, please contact us for a quote. The following prices are for 90 minute parties. If you require a longer package, please contact us for a customised quote.